Whynter - ARC-14S : Portable Air Conditioner Review • The Air Geeks, reviews of air conditioners, dehumidifiers and air purifiers. The ARC-14S is an eco-friendly air conditioner that offers a high cooling capacity and a variety of other impressive features. This dual hose system is specially designed to offer high efficiency without the need for permanent installation. The unit has a sleek design and it is capable of cooling a room within a short time. In addition, this system offers four operational modes, a dual-hose venting system, and a highly effective auto drain function that you can control using its remote. It’s summer and you can wait for this fresh breeze in your house? In case you are looking for a powerful air conditioner, this is one system that you can to consider. Its impressive features and good performance will most certainly make it a satisfactory system for your cooling needs. The ARC-14S is engineered to offer an impressive cooling capacity of 14,000 BTU. 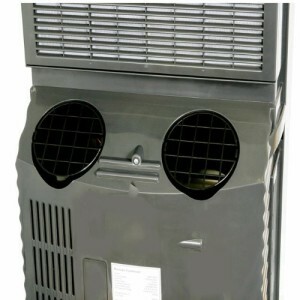 With this capacity, this air conditioner is capable of cooling a large space within a short time. It is an ideal system for a 500 square feet space that has average ambient conditions. This portable unit is suitable for classrooms, workshops, server rooms, living rooms, and more. One of the most important factors to consider when selecting any electrical machine or device is its power needs. This sleek air conditioner consumes minimum energy and uses ozone friendly refrigerants. Use of CFC-free refrigerant, R-410A, makes it an environmentally friendly system that does not interfere with our surroundings. In addition, this air conditioner utilizes components that are lead-free and RoHS-compliant. Accumulation of water in an air conditioner’s tank can result to leaks if the unit is not checked on regular basis. This air conditioner features a highly effective auto drain mechanism that prevents accumulation of the condensate. The moisture that is drawn by the system from the air is used to produce cool and clean air. The ARC-14S dual-hose air conditioner comes with an easy-to-install venting kit that is designed to fit perfectly in standard windows. The kit consists of a slide bar, two extendable exhaust hoses, and fixtures for securing the hoses to the slide bar and the unit. This non-permanent venting system can also be modified to fit elsewhere on the wall or ceiling. It is widely known that the overall efficiency of an air conditioner is greatly determined by the number of hoses it has. Most air conditioners have either one or two hoses. This portable unit features two hoses and this enhances its overall efficiency as well as airflow. This design enables the system to cool a room more efficiently than a single hose air conditioner . This portable unit features a simple control panel to enable users to adjust settings comfortably and with ease. Its control panel consists of simple selections and an LCD display. The selection panel allows users to adjust modes, temperature, and fan speed. In addition, this unit features a 24-hour on/off timer. To enhance user comfort, this air conditioner comes with a remote control to allow users to make adjustments without the need to walk to where the system is stationed. Carrying a heavy system can be a stressful thing if it is not designed well. This is not the case with the ARC-14S air conditioner. It features four multidirectional wheels that make it easy for users to move it from one place to another. This system measures 35.5 x 19 x 16 (inches) and weighs 100 pounds. Every air conditioner has its own mechanism of cleaning and freshening air. 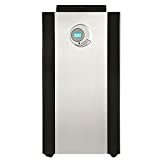 This air conditioner employs a pre-filter for air filtration and an odor-neutralizing carbon filter for air freshening. Its pre-fiter is washable and can be easily cleaned by vacuuming or rinsing it. However, on the minus side, this unit produces a fair amount of white noise when used in a closed room. Good to know! High speed of cooling. This portable air conditioner does a good job of quickly cooling the place. However, we insist on following proper installation as recommended in the user manual. Venting system flexibility. Users can easily install the non-permanent venting kit on windows or modify it to install it on walls or ceilings. 3-in-1 design. The unit offers three functionalities – it is a plus, although you should not rely exclusively on it for dehumidifying. Doesn't cut it for the upper end of the square footage range. Unfortunately, this unit not suitable for cooling 400-500 sq ft spaces, unlike what the manual says. However, it is suitable for a smaller space. Too much noise. You will have to turn up the volume of the TV if you want to place it in your living. This is expected of AC systems, though. I am in a two bed open plan flat. I use this unit to cool the living/dining/kitchen area leaving the bedroom doors closed. I've had experience with two other (different brand) 'portable' units and the main complaint with those is they didn't cool the space and the water tray needed emptying all the time. If the tray was not emptied several times a day they would just shut off. I waited one full season before writing a review as I really wanted to see how well it works. It's a year later and I've just dragged it out of the closet and set it up again and its running beautifully. Running from 9am-8pm with the temp set to 68/70 I empty the tray once every 4-5 days. It has never once shout off on me and I have had ZERO trouble with it." This has been a lifesaver during hot summer days. I agree with the negative reviews about it being noisy, but I have it in my bedroom and I got used to it after 2 nights. I sleep through it now. The LED is also very bright, but not so much that it keeps me awake. I took off a star because of the useless window mount. The hoses weren't long enough for it to reach my window, so I went to Home Depot to build a rig. Replacement hoses are EXPENSIVE, so I didn't buy them. The screws are very short and pop right out of the cheap plastic mount, so I'm using tape to hold them in place. I have since moved and now have casement windows, so I'm in the process of building a new mount in which I will screw the hoses directly into a piece of plexiglass which will sit in the window. I've read that this will work fine, so I'm not concerned about it. One of the negative reviews I read about this unit is that it failed to cool the space. It is designed to cool roughly 600 square feet (a small apartment) so it works fine for my place. I also use a fan to push the cool air into the other room. I like the look of the unit, as well as the fact that it can be a fan or a dehumidifier. I bought plastic tubing for the water collection tank, but it has yet to produce a single drop. The vent hose is doing its job." At the Air Geeks, we were impressed by the three-in-one design of this portable system. With a single unit, you can cool, dehumidify, and fan your room. Nevertheless, the slightly disappointing reach of its cooling effect (300 sq ft, much rather than 500 sq ft), and the noise that it emits are reasons we cannot award an excellent grade. A very good unit, though.